Clarets Sean Dyche felt his side did more than enough to deserve at least a point at Stoke City. Burnley recovered from a challenging first half to recover a 1-0 deficit and claim a draw, courtesy of Ashley Barnes’ leveller. And Johann Berg Gudmundsson might have claimed the points with a late hat-trick of chances. It was another point towards the goal of European football, with the gap now nine points to Leicester City, who have a game in hand, but only four games remaining. And Dyche said: “We could possibly have nicked it, with the chances created at the end, mainly falling to Jo (Gudmundsson) and he’s very unlucky to not get something out of it. “But overall it was a hard-fought game, they’re fighting for everything, and the first half, we weren’t sure, the feel in the stadium, the feel of the team etc, and they gave a good account first half. “We were slightly off it, not a long way, but slightly short, I reminded the players at half-time of how tight it was, that we had to just raise a few things in general, and I thought second half we gave a good performance and were certainly worthy of at least a draw. “Overall, the pleasing thing for me is the effectiveness of our play. We didn’t play as well as we can, but we were still effective. “Arguably their man of the match is the keeper, which usually implies you’ve been effective. Stoke’s opening goal from Badou Ndiaye came after Ashley Westwood felt he should have had a free kick for a tug by Xherdan Shaqiri, before the linesman flagged for a throw in, then changed his mind. 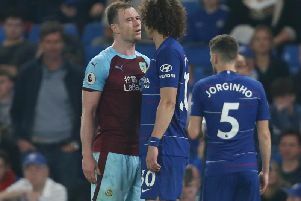 Dyche mused: “The only reason I was asking the question, to put it mildly, was I’ve said all season, I don’t understand, the challenge of officiating is right in front of our eyes. West is getting his arm pulled, trying to keep the ball, and nothing gets given. “The linesman can see it, the ref can see it, but because he doesn’t roll around on the floor he gets nothing basically. “Then the linesmen said he felt the ball had gone out, so he flagged for it, then realised it hadn’t so put his flag down. “Those two moments were confusing, but I just make it clear, we still had time to deal with it after that. “We could have dealt with it better. The balance to that is, if a foul is given, or the linesman gives a throw in, of course it stops that phase of play. Stoke had a big chance to make it 2-0 before the break only for Mame Biram Diouf to fluff his lines, and Dyche added: “It’s a turning point in the scoreline, but I think we just had to adjust things at half-time, half-time can be a wondrous thing sometimes, it gives you that break and the chance to reevaluate and calm down. “Second half we played better. But how do you know how these games pan out? “At the moment, we’ve been here, and even at 2-0, is it done?